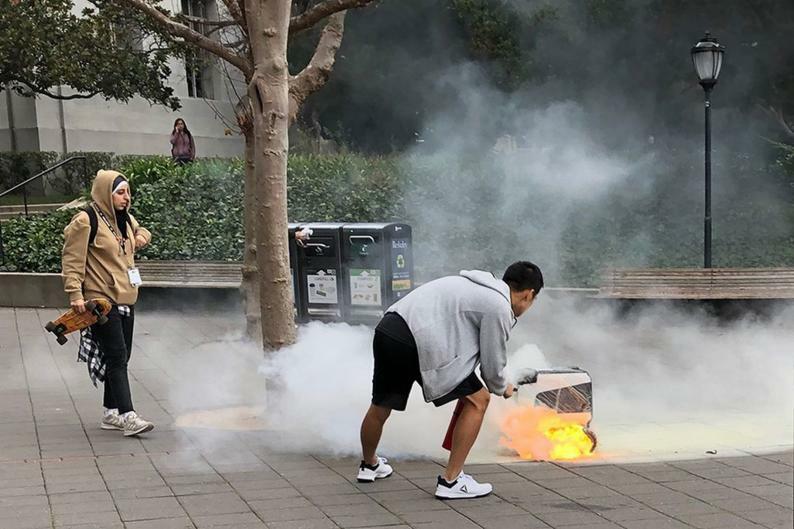 A food delivery robot Kiwibot has engulfed in flames at the University of California, after a human error,its creator has confirmed. Kiwibot autonomous delivery robots have been rolling around the University of California, Berkeley campus for two years. On Friday, students found one of the robots in flames and shared photos on social media. Kiwi said the cause was a "defective battery" that had been accidentally installed in the robot. "One of the batteries for our robot that was idling started smouldering, eventually leading to some smoke and minor flames," the company said in a statement. "A member of the community acted swiftly to extinguish the flames using a nearby fire extinguisher." It is not the first time robots have gone awry. In 2017, a security patrol robot "drowned" when it fell into a fountain. In December 2018, a robot in an Amazon warehouse accidentally punctured a canister of bear repellent, injuring human workers. After discovering the California fire, Kiwi suspended all its vehicles and delivered food orders by hand. The company said it would introduce measures to ensure the "rare occurrence" did not happen again. "Kiwi has put in custom software that will rigorously monitor the state of each battery," the company said. Kiwi was founded by Felipe Chavez, who moved from Colombia to Berkeley to start his company. Its bots have delivered more than 10,000 meals.